Thank you so much for hosting such an amazing event last night at Husker Heroes. Our family is very appreciative to have been included! The athletes were so friendly and caring to all of the kids, and extra patient! My son had the most fun with the gymnasts on the mats - he loved watching him do flips! My son loved seeing Herbie & Lil Red too. In a typical setting, my son would not have the opportunity to meet them because the crowded lines would frighten him. 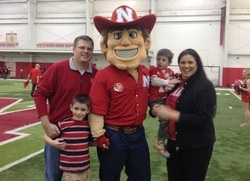 But at Husker Heroes, he got to shake Herbie's hand at least a dozen times! I am attaching our family photo with Herbie. You will see my son holding Herbie's hand. And this subtle social interaction, something as simple as holding a person's hand, was a huge development for him! Thank you again for all the fun memories made last night. Please tell your sponsors how much it means to our families of children with special needs. Deidra P wrote: I just wanted to take a minute and say......THANK YOU....for yet another wonderful year at Husker Heroes! We always have a great time and enjoy talking with the all the athletes. It is great to see them interact with the kids/adults with disabilities.